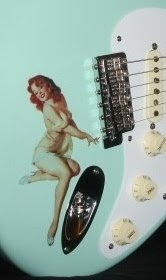 In honor of Leo's birthday today- August 10- what better Friday Strat feature than a vintage 50's era piece! Notice the wear on this vintage '58 doesn't reflect the standard pattern used for relic'd models. Missing is the typical strap wear-thru at the top rear bout area. A large amount of finish wear shows up above the pickguard between the neck and middle pickups. Also around the bottom body edges. Not much visible fretboard wear pattern either, or fretwear for that matter. Anyway, pretty good shape overall, and it includes orig. tweed case, although no pic of the case (duh?). Seller: Gary's Classic Guitars of Loveland, Ohio has lots of vintage inventory.